Virgin Trains East Coast released their 'Travel Buddy' app for iOS and Android recently, before discussing what makes this app disappointing here's a video of the iOS app store reviews at the time of writing. Everyone has rated the app one star so far which is the lowest score available. The best thing about the app? It's the icon! 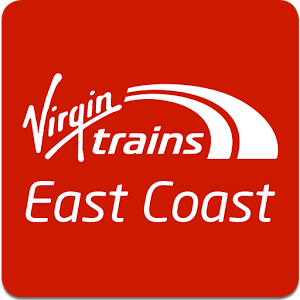 Unlike most places their branding is used it's clear that this app is for Virgin Trains East Coast, now if only they add 'West Coast' to the Virgin Trains app and update their Twitter icons it'd make things clearer for customers. I quite like the name too, but only if it becomes a 'travel buddy' in future and genuinely improves the travel experience. So why is this app rated so poor? The main reason is that at first glance the app does not appear to do anything. If you want to book tickets, manage your account, check departures or any of the other functionality it just opens them in a browser. As well as being a suboptimal experience in itself it also means that even if you've logged into the app you still have to log in separately to book tickets or view your account settings. This is not user friendly at all. I've never been particularly impressed with the existing mobile site for booking tickets, but I think the new beta site does not suit small screens and so having a native app for booking such as the one used by Virgin Trains (west coast) provides a better booking experience. The ticket wallet functionality itself is a bit better than the old 'Ticket Wallet' app that was discontinued last year. There was a delay between booking tickets and them appearing in the old app but tickets booked on the new site seem to appear fairly quickly. It does seem odd that VTEC are rolling out mTickets when VTWC and others are in the process of rolling out the more flexible eTickets. On the railway there was always a rule with most operators that 'print at home' tickets must always be printed out (rather that allowing the guard to scan the barcode in the email) and mTickets had to be stored in a dedicated wallet app rather than being able to use a standard wallet app like Apple Wallet, moving your mTicket from one device to the other involved deactivating it in one and then reactivating in another. For those used to airline boarding passes this did seem to be like extra needless hassle. The reason for this was that if the train guard did not have a means to verify the barcode the ticket wallet app could display an animation that also showed the current time to show this was an active ticket. Although it was possible for a keen app developer to make a fake ticket wallet app, this would be beyond the means of most and hopefully those attempting it could get caught sooner rather than later when they encountered a guard with a scanner. eTickets are now accepted by some operators including Virgin Trains (west coast) and Greater Anglia. The Heathrow Express has their own eTickets for years but their system is standalone from the National Rail network. eTickets are much more flexible as they're based on the assumption that all ticket checkers will have barcode scanners and will be able to immediately verify the ticket. eTickets can be stored in email, in an app, in Apple Wallet or other wallet app. You can transfer the ticket easily between devices, you can print out a copy if you're worried about losing power. VTEC should look at eTickets for offering the maximum flexibility, as more operators adopt eTickets then the more cumbersome mTicket will die off. Finally for those who are unable or unwilling to install the app, here's a look through the core functionality.